After 3,5 years the General Manager of Femundløpet has decided to step down. Today we honored the three winners of the F600 with the flower ceremony at the Malmplassen in Røros. 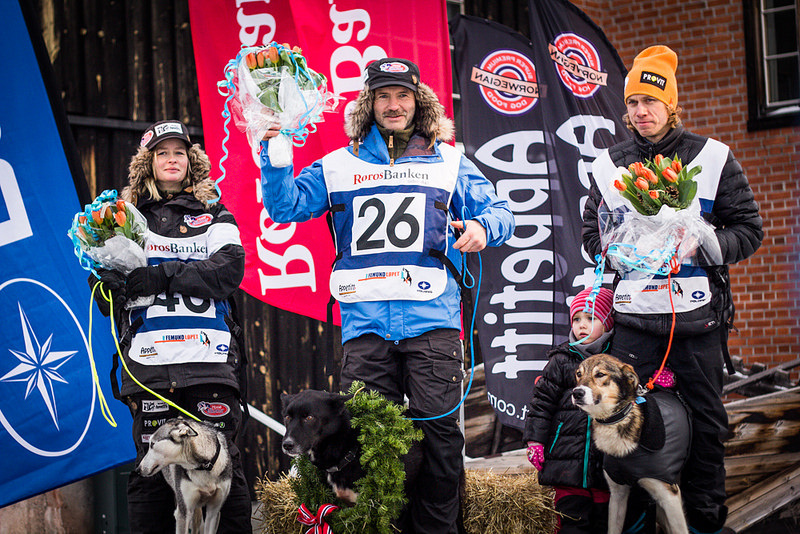 On the pedestal are the lord of the victory, Robert Sørlie with his leader Tore, Birgitte Næss Wærner won the second place and was as well accompanied of her lead dog Arnt Ola Skjerve, bronze winner, took both his daughter and hes lead dog on the podium. King of Femund, Champion - again! It´s his 25th Femundløp. His 11th Femundløpet victory. He has never quit a long distance race, ever. The King of Femund. The Silver fox. The Freight train from Jeppedalen. Dear children have many names. Robert Sørlie is the undoubted lord of victory in the 25th Femundløpet. 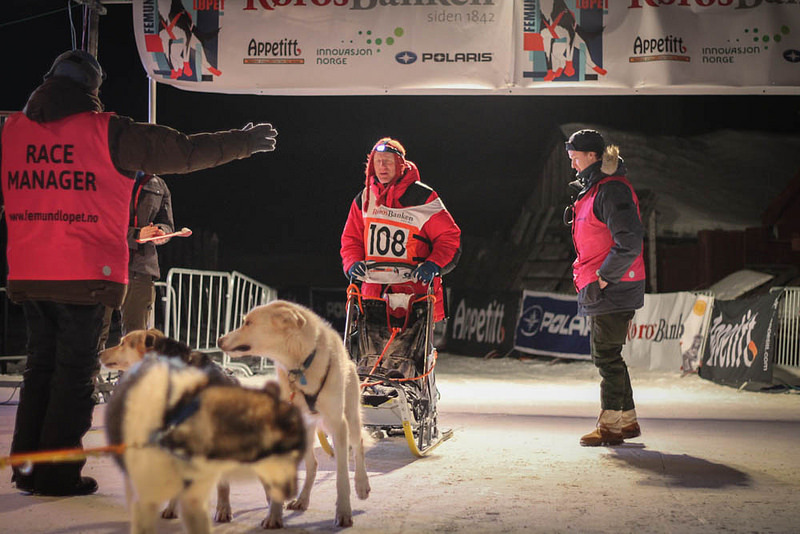 Our congratulations to all mushers for an impressve and nice accomplished Femundløpet 2014! 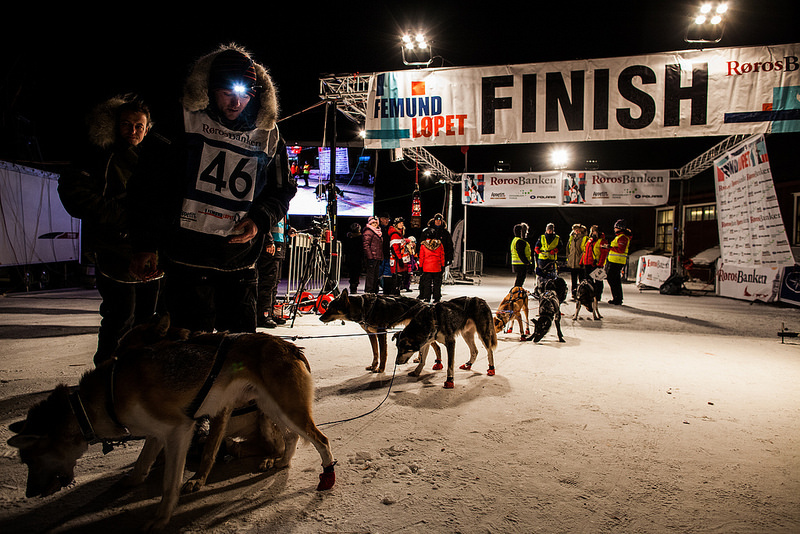 It´s not long to go until the last teams are leafing the check point in Tynset and start their journey towards Tolga and the finish at Røros. 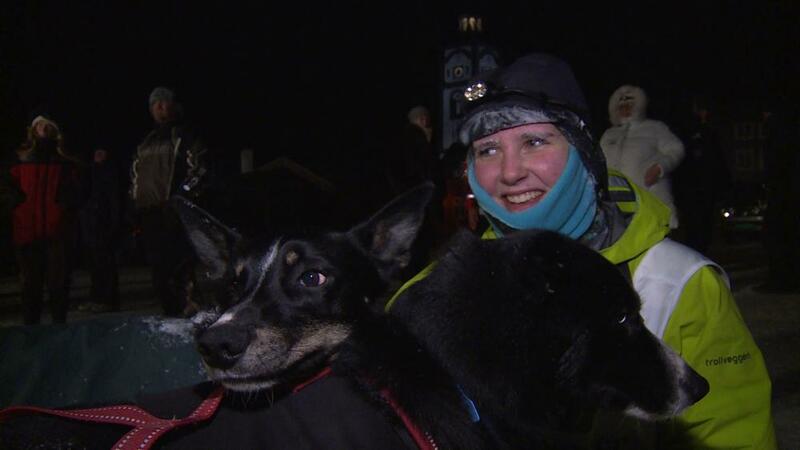 At the check points, there are still volunteers and veteranians busy to take care about mushers and dogs. 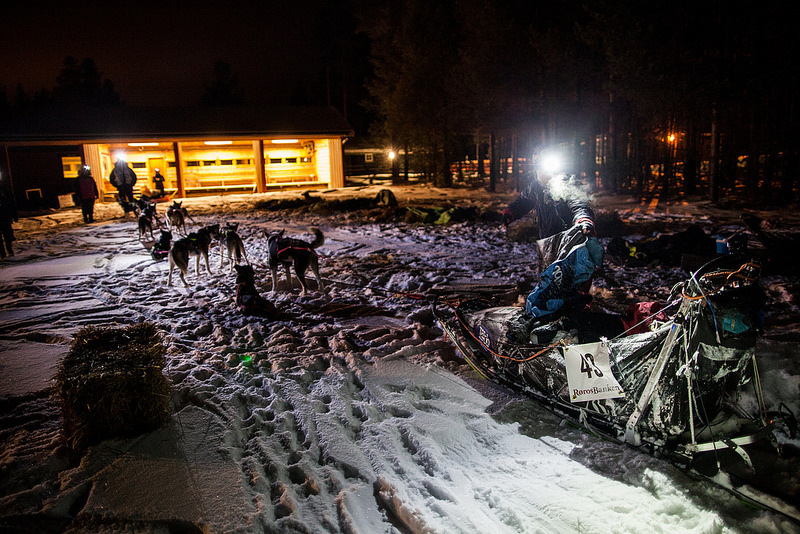 We had a chat with Petter Swift about the last updates from the trail. Birgitte endure the race and saved the second position. 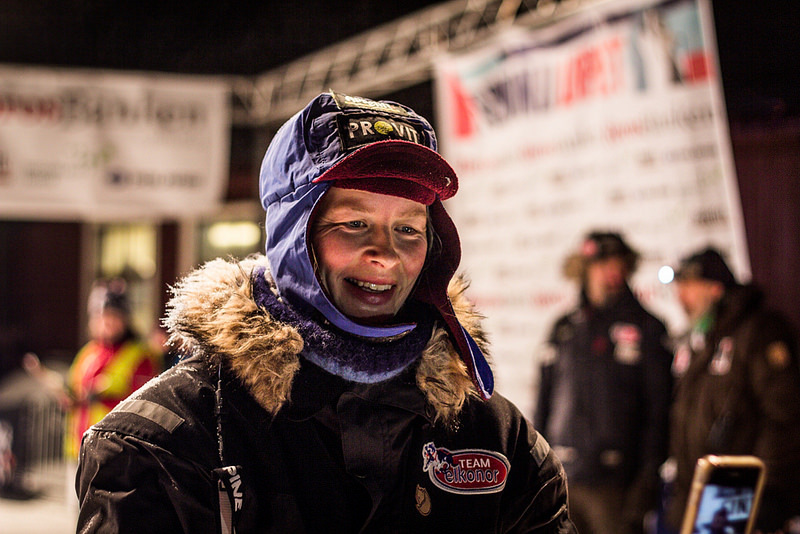 Birgitte Næss Wærner was on second position out of Tynset 2 and she said, she is focusing on keeping it all the way until Røros. As she made it to Malmplassen, it wa precisely the second team finishing in this years F600. In the end of the race it turned out to a breathless chaise for Arnt Ola Skjerve. Robert Sørlie was leading vastly, but Birgitte Næss Wærner was just about the 31 year old mushers range all the time from Tynset to Røros. He did manag to get rid of Sigrid Ekran over Tolgas mountains. 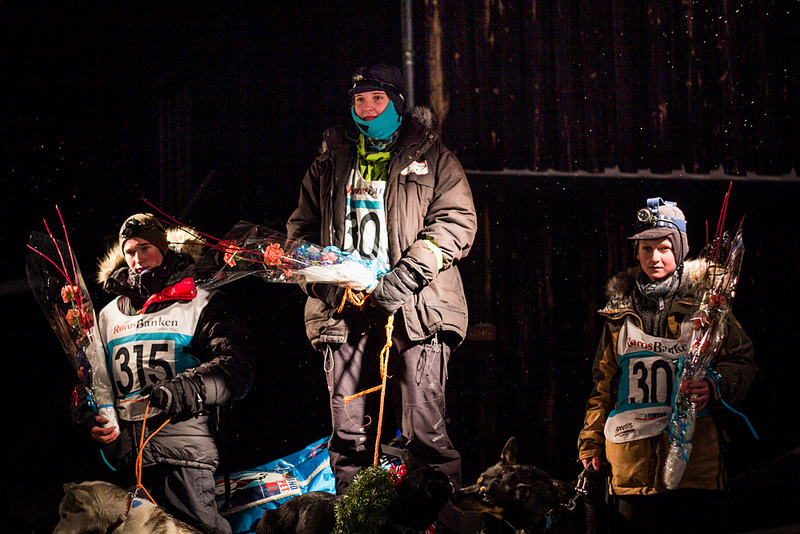 When he arrived at the Malmplassen in Røros, the bronze medal was safe for this years Femundløpet 600. There has the last team been crossing the finish line and the red latern was blown out. 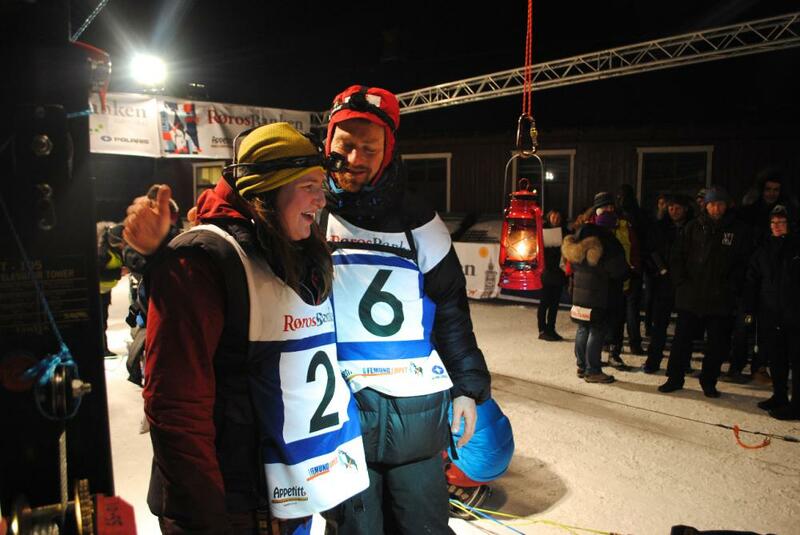 The last teams arriving where Morten Pøher right behind Nora Själin. They have been running together since Tynset. 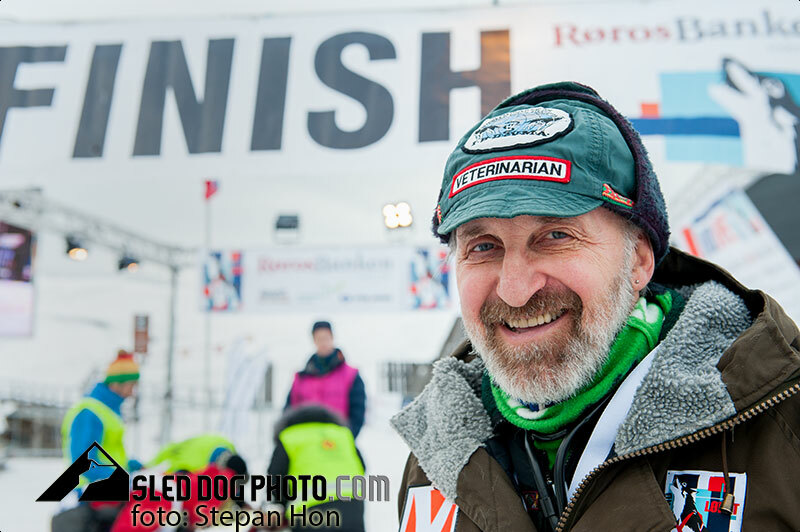 Jerry Vanek is musher, who went over to be a race veterinarian. 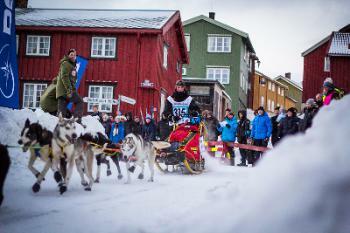 The American is in Røros for the fifth time and looks at it as a privilege to work with the "world best athletes". We will be back shortly with the 600-results. Until then please pay attention to our Norwegian site. We are truly sorry for the inconvenience. Please check out the updated results on our Norwegian site. All participing dogs and mushers in this years Femundløpet deserve glory and honor, but at the award there was one thing standing out specially. We will give you an updat about all the handed out awards from the evening. Prize giving and flower ceremony for F400 was held today at 14:00 on Malmplassen at Røros. We again congratulate the overall winner Roar Kvilvang on coming first, Svein Sødahl Kvam with silver and the bronze winner Silje Christin Lystad. Check out the slideshow and video from the event below. SLIDESHOW The dogs are the true heros in the Femundløpet. This slidshow is for the world best athletes. 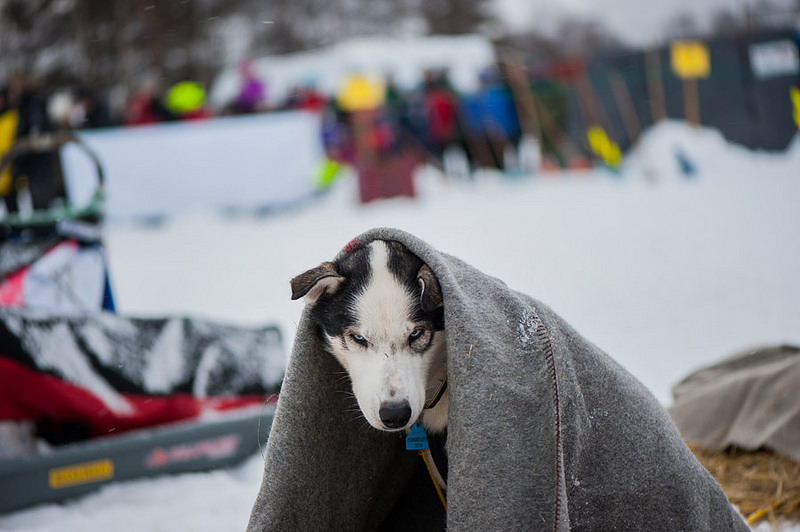 We put together a bunch of pictures from the dogs after arriving and getting a well earned praise and cuddle of their mushers. Roar Kvilvang is the winner and champion of the F400!! Roar pulled a stunt that no one had ever seen before. He rode over the terrain like a storm! For many, pulling off this stunt was a pleasant surprise. Roar Kvilvang drove a formidable race from the start and sailed across the finish line with a superb margin. There is no doubt that this victory was well deserved and we congratulate Roar as the winner of the 400 class and as our new Champion! 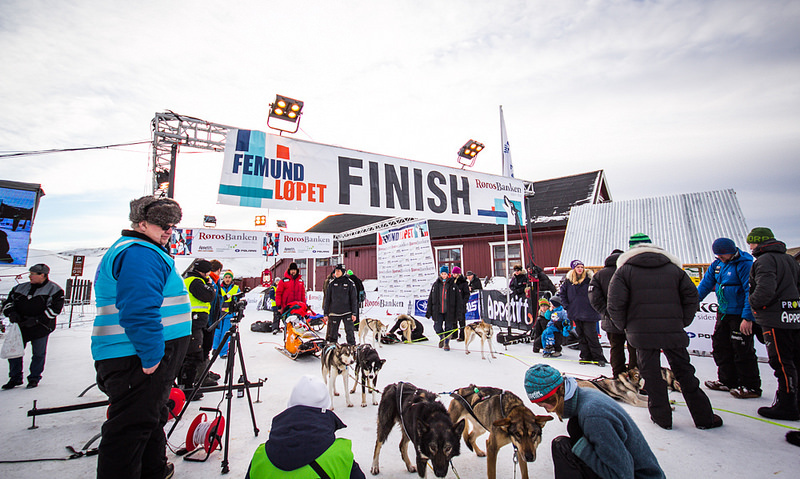 Top 10 finishing positions on Femundløpet 400! Silje Christin Lystad made it to the poll position on F400 and gets the bronze medal in the Norwegian Championship this year. 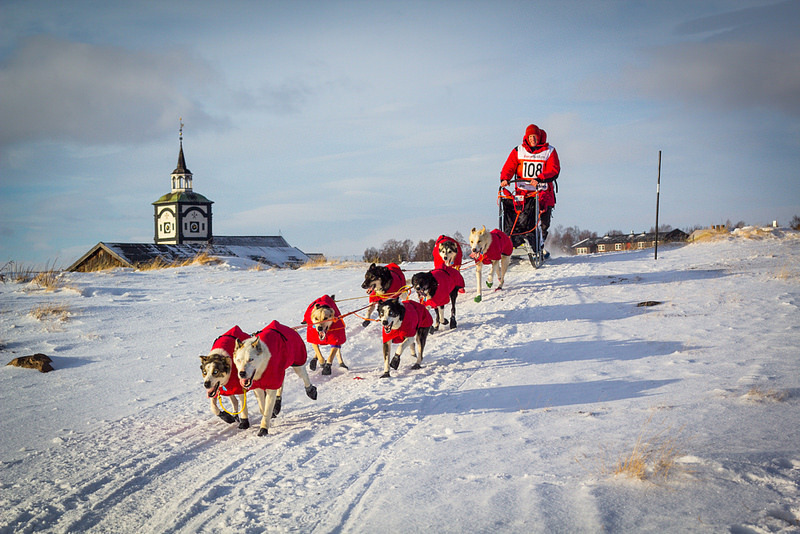 She said before start that she had eight good dogs, and all eight of them made it to the finish line, although a little bit more tired and one of them in sled. 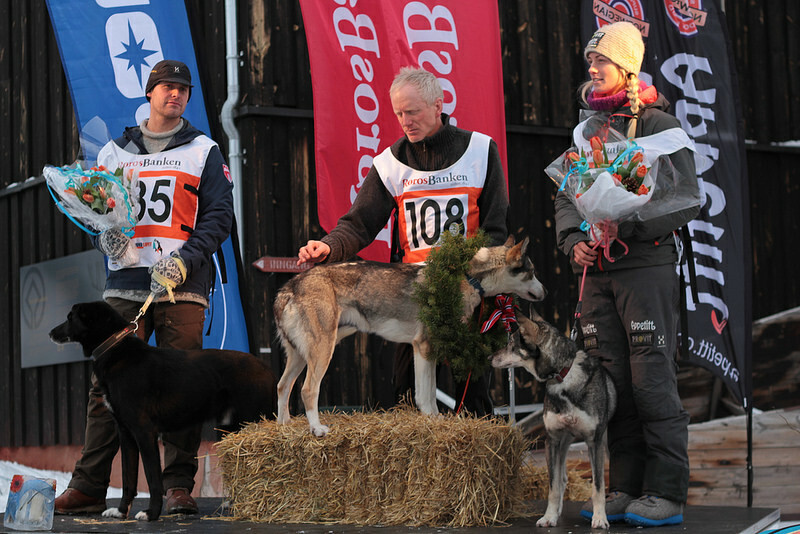 Svein Sødahl Kvam kept a good distance from his contestants after leaving Tolga, which lead to him getting the silver medal of this years Norwegian Championship. He has had a good and steady run and tried to not push his dogs to much, even when the competition stiffened at times. Mascha Verweijs stated ‘This is a success’, her words thick with irony. 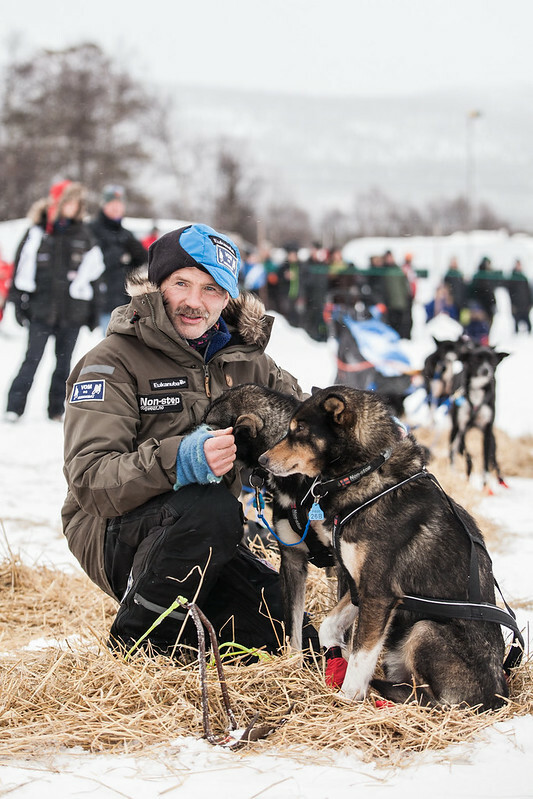 Edmond Schoemacher came into the Søvollen checkpoint at 7:30 this morning with their dog team and they are still there now. They are the only team left from the F600. 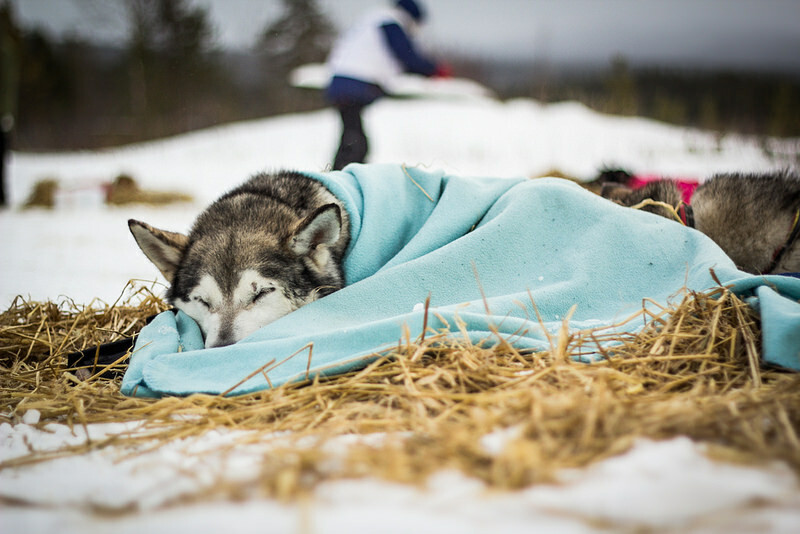 Mushers are considerate and do not take chances with their dogs nor do they push them too hard. The racers listen to advice we give, says one of the veterinarians who was on duty late on Sunday night. The vets also say that they have the overall impression that the dogs are well cared for and that this gets better and better with each passing year. 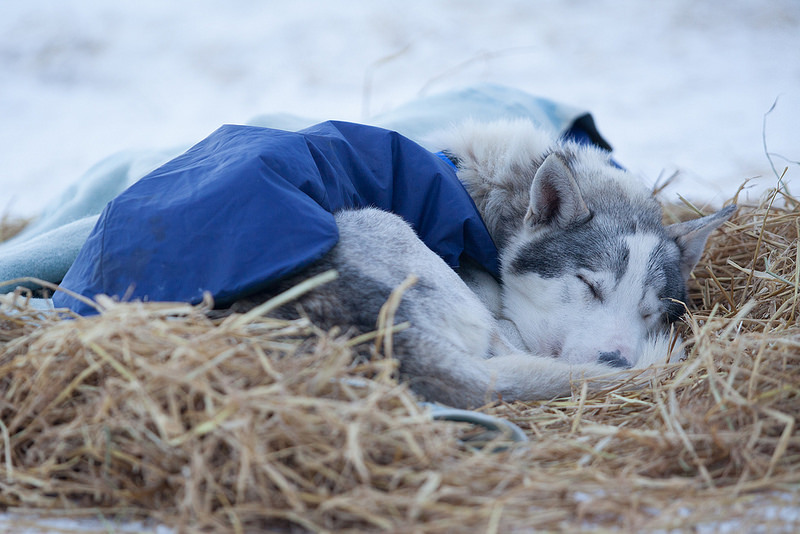 Competing in dog sledging takes its toll physically and mentally for both mushers and their dogs. Therefore there are obligatory rest periods for all dog teams in all classes. This is to ensure the dog teams are healthy and safe. Nobody has ever tried to race so many laps so quickly in the F400 and come out of it so well. This is what Roar Kvilvang is trying to complete. Will he set new guidelines and a new standard for the F400? The F600 race has gotten a new beat. This time, the rhythm is provided by Robert Sørliveien and Birgitte Næss Wærner. 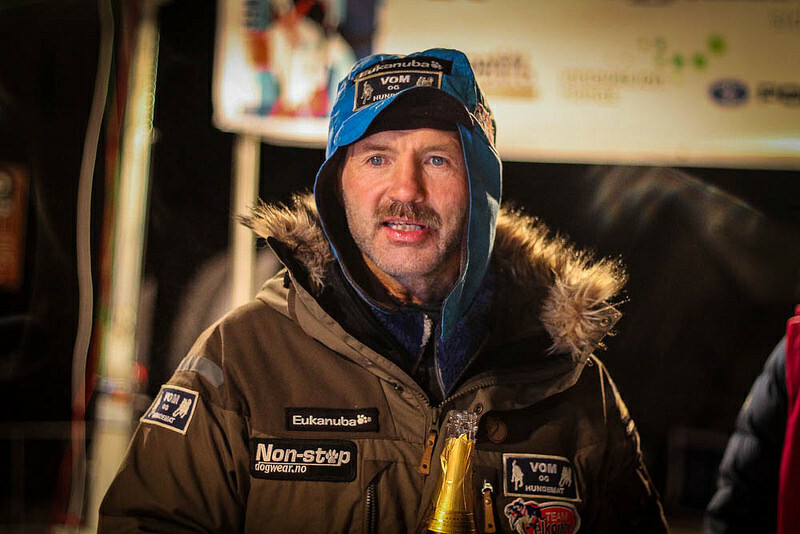 Emil Inauen has left the race reports Ljone Fredrik Holst from the Grimsbu checkpoint. 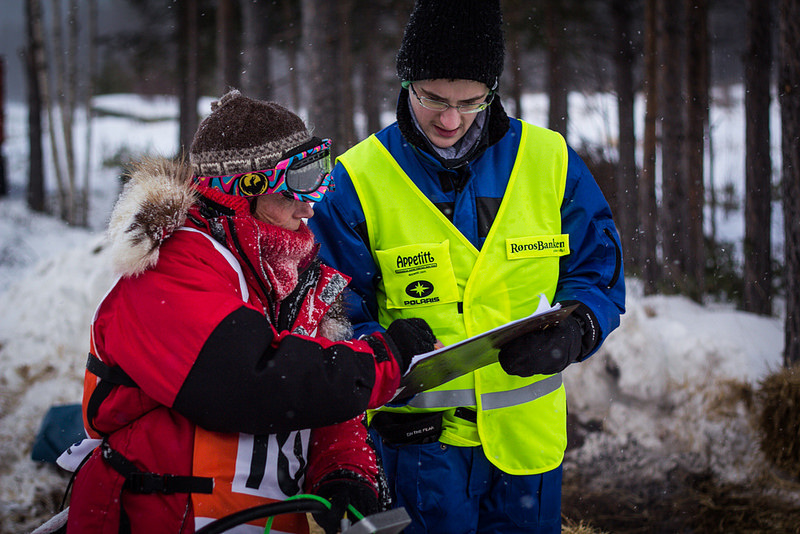 There are many different opinions regarding the GPS-tracking system that Femundløpet have used this year. We have interviewed Peter Swift, who is responsible for the GPS system, about his experiences with this years equipment. We are waiting for the last two junior teams to cross the finish line at Malmplassen. Until then you can enjoy a video from the check outs of the juniors in Tolga yesterday evening. Trond Anton, a volunteer from Finnmarksløpet, had a short chat with Marianne Skjøthaug about the hills and mountains on the Femund trail. We hope the irritation goes over until next year. F600 did get a new beat. This time the rhytem section is formed by Robert Sørlie and Birgitte Næss Wærner. We can almost promise a beat you can danse with, because it will be a fast one. We have received confirmation from Stein Kaasin, one the organizers of Tynset checkpoint, that Elisabeth Edland has left the race. - Kvilvang travelled thorugh Grønfjell before the storm came! 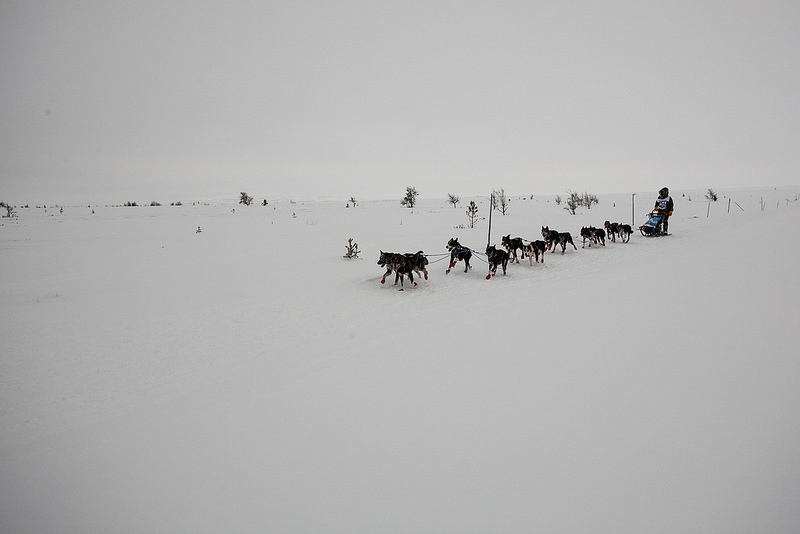 We had to call the check point in Tynset to be able to believe what we heared about Roar Kvilvang. And we got the confirmation. Kvilvang already passed Tunset and is running in good speed towards Tolga. While we are waiting for the two last junior muserhs, we made a video clipp of interviews from the finisher tonight. Thomas Wærner talks about the lead in F600. Tonight we informed about Thea, who as ben bitten while braking up a fight between the dogs. There was no drama in order of this situation, but the safety team decided to go and get her by snowmobil. Of cours we would like to hear from her what happend exactly. Watch veteran Kjell Brennodden talk about the round of Folldal. Torjus Mortensen Bakk (15) is saving himself bronze in theis years jusnior Norwegians championship. We had a chat wit the boy whose dogs where parking in the drifting snow, but still managed to catch the 3th place. In the nights obscurity and darkness may happen everything. We are giving you an update from what happended within the last hours! 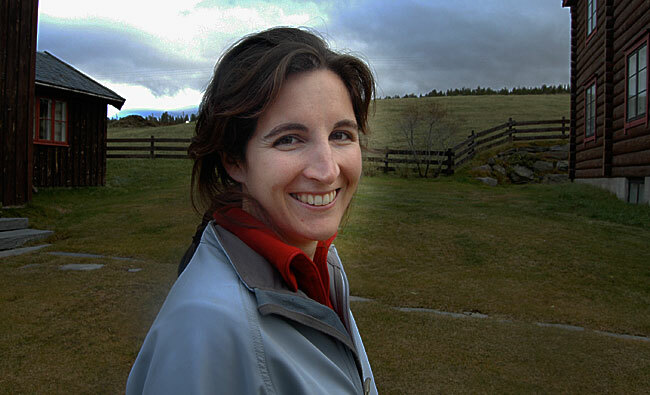 Thea Mortensen Holien is safely back in Tolga after a snakk fight between to dogs. Torjus Mortensen Bakk´s team parked while crossing the mountains, but managed to keep them on running aftr a while. The safety team evaluates the situation as safe and secure enough so that Line Rønning Bakås and Aud Kristin Bjørgrum can leave Tolga. Thea Mortensen Holien did get som help to get down from the mountains, the cause was a bite wound. The safety team etablished contact with her and is on the way out to support her on the way down to Tolga. There was no talk about serious injury. Watch the video from the junior winner and Norwegian Champion Anette Børve Hernes finishing the race. The weater has been changing in the last hours and it came up a cold breeze in the mountains. The teams moving above the tree line are experience challanging conditions with bad view, what makes a average run hard. All junior race participant have been taking a rookie course, where they have been teached how to akt and behave tough and hard weater contitions. 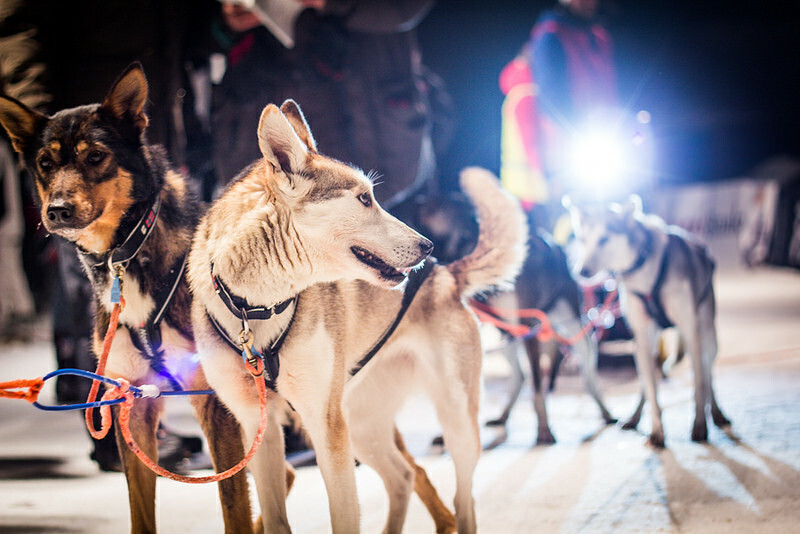 Additional all mushers have equipment and food accessible in their sleds, to be able to survive severel days in the mountains in actual conditions. All mushers are well equiped to handel the situation. Nevertheless the safety team is checking along the trails to be sure, that everything is ok. For safety reason the race manager has decided to keep Line Rønning Bakås and Aud Kristin Bjørgum in Tolga, as long the safety team is busy in the mountains. The management of Femundløpet is followint closely with all the happenings along the trail. 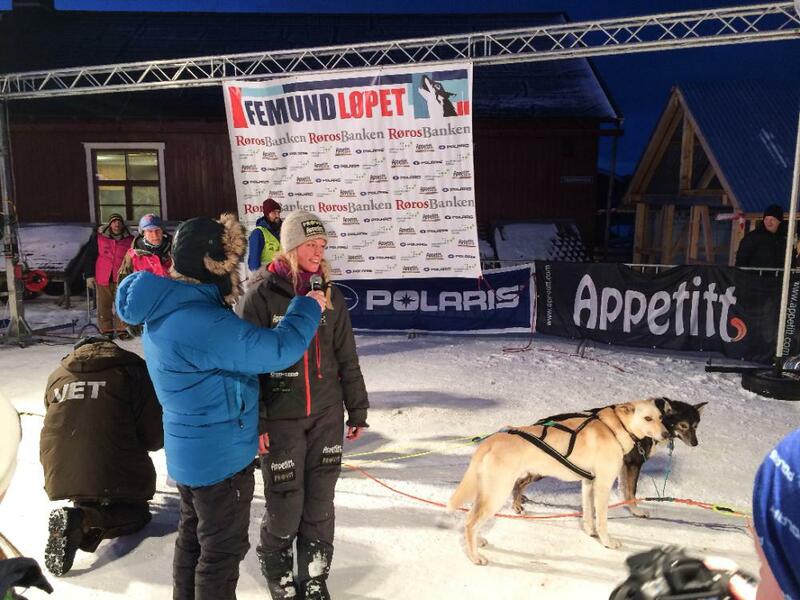 Femund Junior: Marcus Kampesveeen finished in second position! Concratulations! We are impressed by the efforts in this tough conditions. After some incidents in the mountains for reason of the weather, managed Torjus Mortensen Bakk regardless to finish the race on a solid third place, behind Anette Børve Hernes on first and Marcus Kampesveen on second place. We concratulate all three with their placements! 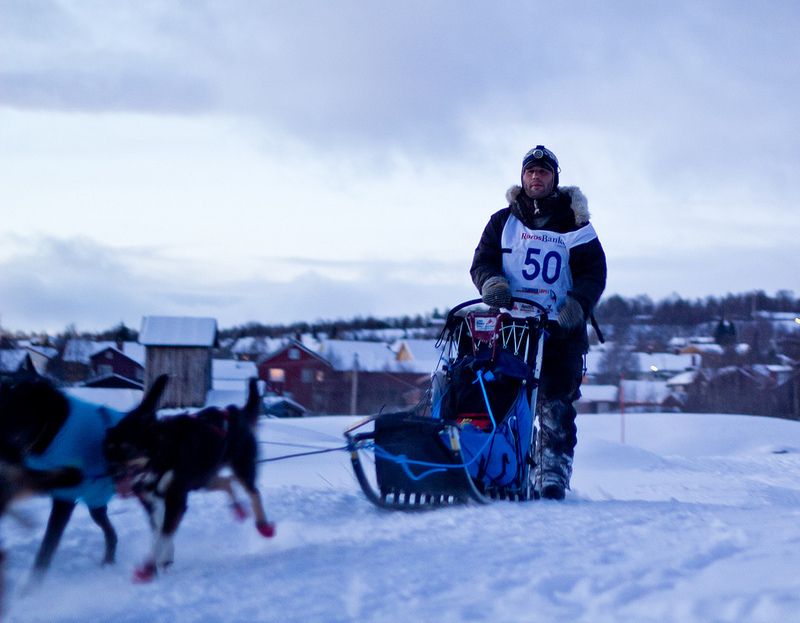 F400: Without hes most experienced leading dog Jimmy Pettersson had to work hard behind the sled. Oh, it was tough, he bursts after arriving in Tufsingdalen. Anette Børve Hernes (16) is winner of the Junior-race and Norwegian Junior Champion 2014! Anette Børve Hernes is theis years winner of the junior race. She was leading all the way from the start to the finish. Congratulations, Anette! 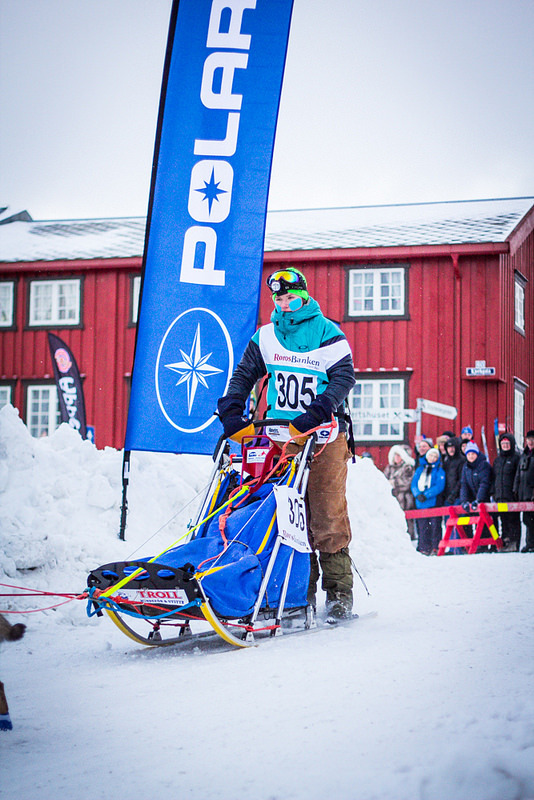 F400: Vidar Løkeng is a long time experienced musher from the Finnmark race. This year he is scooting the F400. 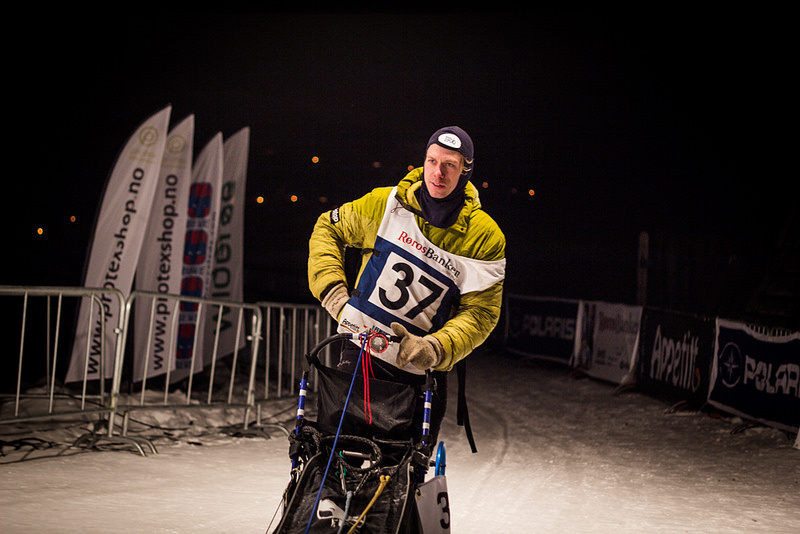 Now it´s about having a Femund experienced handler, as such as Reidar Stenmark. 01.02 2014 15:09 Follow the race on Instagram! For older articles, please refer to our archive.